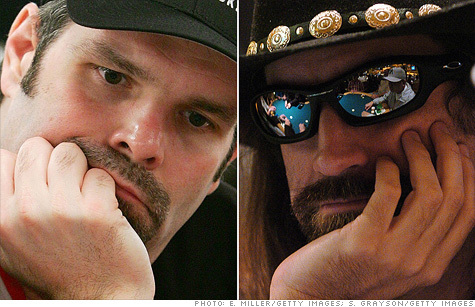 Poker celebs Howard Lederer, left, and Christopher Ferguson have been charged with profiting from a $440 million online poker Ponzi scheme. NEW YORK (CNNMoney) -- Federal prosecutors on Tuesday accused executives at the online site Full Tilt Poker of operating a Ponzi scheme, siphoning more than $440 million in gamblers' winnings to board members and owners. The U.S. Attorney's Office for the Southern District of New York also charged poker celebrities Howard Lederer and Christopher Ferguson of taking part in and profiting from the scams. According to the complaint from U.S. Attorney Preet Bharara, Full Tilt Poker and its board, including Lederer and Ferguson, "defrauded players by misrepresenting that their funds on deposit in online gambling accounts were safe, secure, and available for withdrawal at any time." "In reality, Full Tilt Poker did not maintain funds sufficient to repay all players, and in addition, the company used player funds to pay board members and other owners more than $440 million since April 2007," the complaint read. The prosecutor is seeking money laundering penalties against the poker champs and is also seeking the forfeiture of money gained from the alleged scheme. The original complaint from April charged board member Raymond Bitar and 10 other defendants with bank fraud, illegal gambling and money laundering offenses. "Full Tilt was not a legitimate poker company, but a global Ponzi scheme," said Bharara, in a press release. "Full Tilt insiders lined their own pockets with funds picked from the pockets of their most loyal customers while blithely lying to both players and the public alike about the safety and security of the money deposited with the company." Barry Boss, the attorney representing Full Tilt Poker told CNN, "After Bernie Madoff, that is a particularly loaded term in our culture, and it is completely inappropriate to apply that label to Full Tilt Poker. It is especially problematic at the present moment because the company is trying to attract investors so that players can be paid back." The sites for Full Tilt Poker and PokerStars have been shut down in the U.S., and are now embossed with the seal of the U.S. Department of Justice. They exist only as a means to pay back gamblers, according to settlements signed with the U.S. district attorney in April. But the sites for Lederer, the self-proclaimed "Poker Professor," and Ferguson were still up on Tuesday, with links to the Full Tilt Poker site. Ferguson's site invites gamblers to "play me online at Full Tilt Poker," even though the site is shut down. Lederer's site offers a similar invitation. Attorneys for Ferguson and Lederer could not be located. PokerStars spokesman Eric Hollreiser said his company's Web site is still operational outside the United States. The company is based on the Isle of Man, a British crown dependency located in the Irish Sea. The prosecutor said that, as of March 31, Full Tilt Poker owed about $390 million to players around the world, including $150 million to U.S. players. But the company only had $60 million in bank accounts to pay them back. Full Tilt paid more than $443 million in player funds to the board of directors and other owners, with $41 million going to Bitar, $42 million going to Lederer, and nearly $12 million going to another board member, Rafael Furst. The company paid $25 million to Ferguson, and said that it owed him another $62 million, according to the prosecutor's office, noting that much of the money was transferred to Swiss and overseas accounts. "In order to maintain its false image of financial security, Full Tilt continued to credit player accounts without disclosing its inability to fund those credits," the prosecutor said. "When players gambled with these phantom funds and lost to other players, a massive shortfall developed." The prosecutor said "this scheme continued even after the original complaint was filed and the criminal indictment unsealed in April." As time went on, the poker site had even less money to pay its customers. By June, Full Tilt owed $300 million to players around the world but only had $6 million to pay them, according to the prosecutor's office.